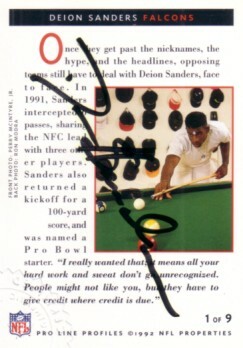 1992 Pro Line Profiles certified autograph card of former Atlanta Falcons superstar cornerback and kick returner Deion Sanders. NOTE: card has a tiny hairline crease visible only on the front (non-autographed) side of the card. ONLY ONE AVAILABLE FOR SALE.